Cinematographers, Colorists, and anyone else wanting to capture the elusive film look, take note. VisionColor has just released one of the most comprehensive suites of film emulation Lookup Tables (LUTs). At Radar, we were lucky enough to be part of the Beta process for ImpulZ. We pride ourselves on providing cinematic results for our clients and we’ve had great experiences with VisionColor products in the past, so this amazing new toolset definitely sparked our interest. Often times, getting accurate film looks requires third-party plug-ins or applications. ImpulZ LUTs, on the other hand, can be used in nearly any non-linear editor (NLE) or color-grading tool currently on the market without altering existing workflows. ImpulZ includes emulations of 16 different film stocks, including industry standards like Kodak Vision3 500T 5219. To keep results consistent, ImpulZ provides patches for the a variety of popular color science and camera combinations, as well as generic Log and Rec709 patches. That means a shot from a Blackmagic Cinema Camera, a RED Epic, and a Canon 5D can theoretically be color matched to the same film stock in a matter of seconds. Additionally, each film stock emulation has four different output gamma and color response profiles available: Film Contrast, Film Print, VisionSpace, and CINEON® LOG. The Film Contrast and Film Print profiles are both contrasty and make it easy to get to a finished film look rapidly. This makes them great for creating a quick look in editorial or loading them into monitors on-set during shooting. For those who want to spend some more time finessing, the VisionSpace and CINEON® LOG profiles are the way to go. VisionSpace is custom built by VisionColor. It is less contrasty than the Film Contrast and Film Print profiles, and acts as a great place to start a grade without loosing any color or luminance information. CINEON® LOG is the most robust of the output profiles. It was built to emulate the process of scanning an negative for digital intermediate. Once a shot has been graded with the CINEON® LOG profile, film print stock emulations can be added. This is probably the best emulation of a photochemical workflow anyone has seen in the world of digital cinema. ImpulZ comes in three packages: Basic ($53), Pro ($75), and Ultimate ($135). The Basic Package includes emulation LUTs of a few Fuji and Kodak still stocks with generic LOG and Rec.709 patches, the Film Contrast and Film Print output profiles, and a Kodak 5219 Film Grain Overlay at 1080p. The Pro Package includes a few additional specialty film stocks, patches for various low cost cinema cameras, adds the VisionSpace output profile, and a 2.5K version of the Kodak 5219 Film Grain Overlay. Finally, the Pro Package adds six Kodak Vision3 stocks, support for higher end digital cinema cameras, the CINEON® LOG Output profile, and a 4K version of the Kodak 5219 Film Grain Overlay. ImpulZ is available for purchase at VisionColor and Color Grading Central. 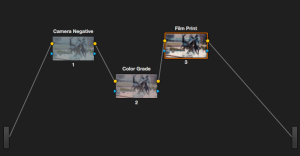 ImpulZ Quick Start Guide and Overview from Color Grading Central on Vimeo.